HEAVY METAL KIDS was formed in 1973, and swiftly signed with Atlantic. Most famed member may well be Danny Peyronel, who left the band for UFO, but returned to replace original vocalist Gary Holton when the latter untimely perished. The other kids are; Marco Guarneiro, guitars/vocals, Marco Barusso, guitars/vocals, Ronnie Thomas, bass/vocals, and Keith Boyce, drums. This album was the band´s sixth album, including one live outing, when it was originally released in 2003. This remastered edition also includes four bonus tracks recorded live in 2004, in both London and Milan. Good old fashioned power pop with a contagious refrain is typical of opener “Message”. Danny´s voice seems to be caressing his “Girl of My Dreams”, in more of the same pop with rock backing. It is all very easy to digest and I could do far worse than cruising along the beach with this one in my speakers. The pace increases in “Blow It All Away”. It is not hard to understand why Danny did time in UFO, his voice is even similar to Phil Mogg´s. The title track is UFO meets keyboard laden power pop. The band is top notch song writing-wise, and the lack of fame seems unjustified. The album carefully cruises betwixt 70-ies rock à là UFO, and pop refrains with glue in the words. The contagious “Viva New York!” has a refrain that is reminiscent of an old DEMON song too. The slower “I Walk Alone” makes HEAVY METAL KIDS a deadringer for UFO. Another vitamin injection is “Gotham City”, complete with oddball lyrics. I happen to have the original issue of this very album and the sound update feels necessary. The Live tracks are all from the seventies, and seems like distinct hits. “Chelsea Kids” has a riff full of grooves, “She´s No Angel” is a homage to teenage dreams, there are punk vibes in “The Cops Are Coming”, which also goes for the riotous “Delirious”. 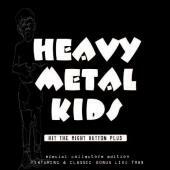 THE HEAVY METAL KIDS seems to have grown up, but anyway you see it this is quality 70-ies pop rock with classic Brit rock edges.